Foreign automakers are bracing themselves for declining sales as China's economy slumps. 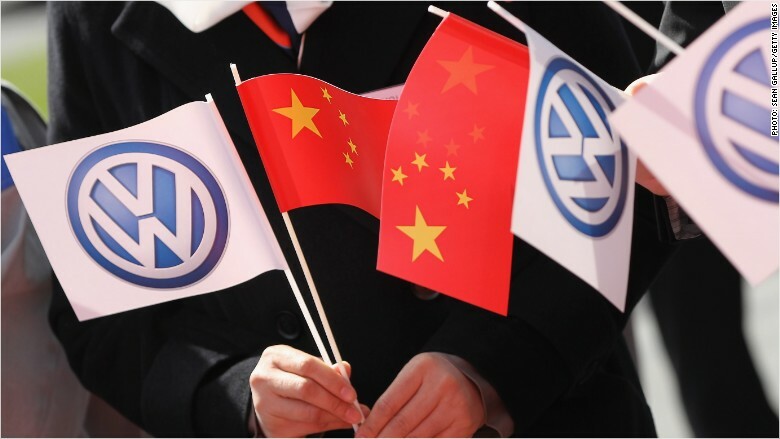 BMW (BAMXF), Volkswagen (VLKAF), and Peugeot (PEUGF) have all reported slowing sales in recent earnings reports, and Ford (F) singled out the Chinese economy as a major risk. Sales of passenger cars fell nearly 7% in July to their lowest level in 17 months, while production tumbled nearly 12%, according to the China Association of Automobile Manufacturers. Weak sales reflected the slowdown in economic growth, according to Barclays auto analysts, and there's little sign of improvement in the short term. "We believe the sluggish auto sales will continue until at least the end of 2015 given a lack of evidence supporting economic stabilization or recovery," they wrote in a research note. Volkswagen, the world's largest automaker, has seen its stock tumble around 12% in a month. Mercedes owner Daimler (DDAIF) and BMW have suffered similar falls, while Japan's Toyota (TM) is down nearly 19% over the same period. Rising wages in recent years fueled a car buying spree in China. Auto sales ballooned an astonishing 24% a year on average from 2005 to 2011, making China the world's largest car market ahead of the U.S., according to McKinsey. Carmakers clamored to increase their footprint in China, building giant factories and striking joint ventures with local companies. But the industry has hit a rough patch this year as Chinese economic growth slumped to its slowest pace since the financial crisis. A stock market rout this summer has also hurt consumer sentiment. Adding to the industry's woes, major cities including Beijing and Shenzhen have restricted new car registrations by limiting the number of license plates in an effort to curb pollution and traffic congestion. Dealerships are even slashing prices in an effort to entice buyers and reduce inventories, according to Chinese state media, sparking what some carmakers have warned could become an all-out price war. Auto companies will increasingly have to look for growth in smaller cities, where vehicle restrictions haven't yet been introduced, said Deloitte's Xu Sitao. Carmakers may also see a boost once auto financing catches on -- in China, most people still buy cars with cash on hand, he said. Plus, with only about 80 cars per 1,000 people in China, there is still plenty of potential demand ahead, according to Barclays. U.S. car ownership is nearly ten times higher, at around 800 cars per 1,000 people, according to Deloitte. Both Barclays and McKinsey estimate that China's auto industry could still grow around 8% a year over the long term.